Tile+ is a simple plugin that enabled user to add some popular basemap such as Open Street Map(OSM), Google, Bing, ESRI and some updated earth data from Real Earth like rainfall rate, earth visibility, sea surface temperature, etc to QGIS map canvas. This plugin is version 0.1 and developed for QGIS 3.x. Installing Tile+ is really easy using distributed ZIP file. Follow these steps to do the installation. 3. The Plugins window will appear as in figure 1. Select Install from ZIP. Then select the downloaded ZIP file and Click Install Plugin. Running the plugin is quite simple. 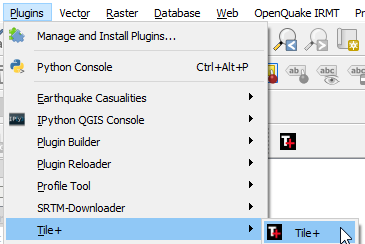 Just select the Tile+ plugin icon or select from Plugins menu as in figure 2. The plugin window will appear like figure 3. 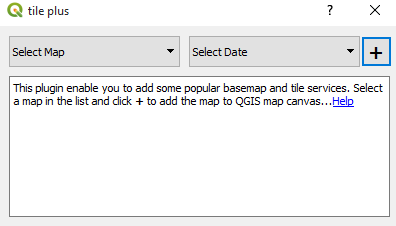 Select a map in the list and click + button to add it to QGIS map canvas. If a map contains a list of date, then it will load all available date into the select date list. You can find the quick explanation about the map in the text area below the list. If you want to find more information about the map, just click more detail link. In the animated gif below, can be seen the the Tile+ in action. Please free to explore, if you find any bug just give a comment below.